Morecambe inflicted more misery on winless Newport County as Paul Mullin scored a stoppage time penalty to grab a third successive win. The visitors soaked up early pressure and took an unlikely lead from Alan Goodall's header from a corner. 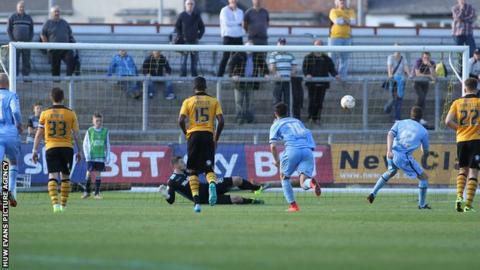 Scott Barrow scored his first Newport goal to level with a drilled effort into the bottom corner from 25 yards. But substitute Mullin converted from the spot in the 94th minute after a foul on Kevin Ellison. Newport County manager Terry Butcher told BBC Radio Wales: "I can't describe the feeling in the dressing room to be honest. It's one of devastation and huge, huge disappointment because we played so well in the game. "We made enough chances to have won two or three games, especially in the first half. To go in a goal down at half-time was a travesty. "To lose the game 2-1 is an even bigger travesty because it's one long ball over the top, two minutes to go in added time and we don't deal with it and we've paid a heavy price." Match ends, Newport County 1, Morecambe 2. Second Half ends, Newport County 1, Morecambe 2. Aaron Hayden (Newport County) is shown the yellow card for a bad foul. Foul by Aaron Hayden (Newport County). Goal! Newport County 1, Morecambe 2. Paul Mullin (Morecambe) converts the penalty with a right footed shot to the top right corner. Penalty Morecambe. Kevin Ellison draws a foul in the penalty area. Penalty conceded by Aaron Hayden (Newport County) after a foul in the penalty area. Medy Elito (Newport County) wins a free kick in the defensive half. Attempt missed. Lee Molyneux (Morecambe) left footed shot from outside the box misses to the right from a direct free kick. Attempt missed. Seth Nana Ofori-Twumasi (Newport County) right footed shot from the right side of the box is close, but misses to the right. Lee Molyneux (Morecambe) wins a free kick on the right wing. Substitution, Morecambe. Paul Mullin replaces Tom Barkhuizen. Attempt missed. Kevin Ellison (Morecambe) header from the right side of the six yard box is close, but misses to the right. Substitution, Newport County. Medy Elito replaces Scott Boden. Corner, Newport County. Conceded by Alex Kenyon. Corner, Newport County. Conceded by Barry Roche. Corner, Newport County. Conceded by Lee Molyneux. Substitution, Newport County. Zak Ansah replaces Aaron Collins. Goal! Newport County 1, Morecambe 1. Scott Barrow (Newport County) left footed shot from outside the box to the bottom right corner. Assisted by Aaron Collins. Attempt missed. Lee Molyneux (Morecambe) left footed shot from outside the box is close, but misses to the right. Aaron Collins (Newport County) wins a free kick in the defensive half. Adam Dugdale (Morecambe) is shown the yellow card for a bad foul. Second Half begins Newport County 0, Morecambe 1. Substitution, Morecambe. Alex Kenyon replaces Jamie Devitt.